The SATDUP11IMG standalone SATA hard drive duplicator, lets you create an exact duplicate of a SATA hard drive (HDD) / solid state drive (SSD), or create a single backup library drive containing multiple images you can copy to additional drives at any time. Fast, Simple Drive Duplication Reduce clutter with the SATDUP11IMG eliminating the number of drives required when creating backups of multiple unique drive images. Using a single backup library drive, you can store several unique drive images on a single SSD / HDD, ensuring fast duplication at 6 GBpm and minimal clutter.This is an ideal solution if you frequently re-image different computer systems, because it means you'll only have to carry a single backup library drive to restore multiple drive images onto different systems. Hassle-free Performance The versatile duplicator also offers standard one-to-one drive duplication in three different modes: file & system copy, all partitions copy and whole copy. 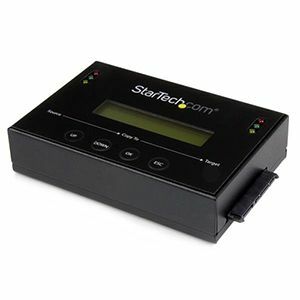 This is ideal for one-time drive duplication, eliminating the hassle of creating a drive image for a one-time project. Intuitive Operation With an easy-to-read LCD display and intuitive four-button menu operation, the SATDUP11IMG ensures hassle-free setup and control. The menu gives you push-button access to many value-added features that ensure simple task management such as: drive to drive duplication, drive to Image library backup and restore, and many more. It also provides numerous advanced setup options for experienced users. The SATDUP11IMG is TAA compliant and backed by a 2-year StarTech.com warranty and lifetime technical support.